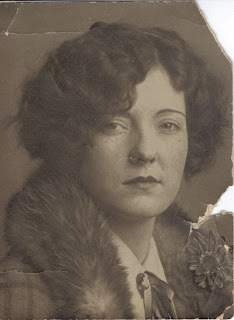 My Great Aunt Myrna Elva [Mason] Winters was single as long as I knew her. Of course, I knew that she was once married, because her last name wasn't Mason anymore. But I was only 7 years old when she died... so "widow" and "single" meant the same thing to me. What was mysterious about Myrna, though, was that after her death we found out she had been married before. In her jewelry box, my aunt Melinda found letters and a wedding announcement. She was married to Raymond Harvey Derrick sometime in the 1920's (the announcement didn't have a date). Back in 2009, I took Melinda's Myrna notebook home. It contains pictures, letters and newspaper clippings. It seems that R. H. Derrick maintained his communication with Myrna's parents for years after they must have divorced. I haven't found any record of a divorce (those records are not available online).